A unique and innovative method for treating mining ore slurry. Reducing WAD Cyanide to below 50 ppm in compliance to the global TSF management regulation (International Cyanide Management Code [ICMI]). Extraction and destruction of all forms of cyanide from the slurry and treatment of the water for discharge or reuse purposes by the mine. In the WAD reduction process, the slurry is treated directly from the mine’s facilities and the treated slurry is pumped and returned to the TSF with a CN WAD lower than 50 ppm. A semi dry sludge that can be pumped back to the TSF or used as a filling material. Purified water that complies with the local regulation for environmental discharge or for reuse purposes. 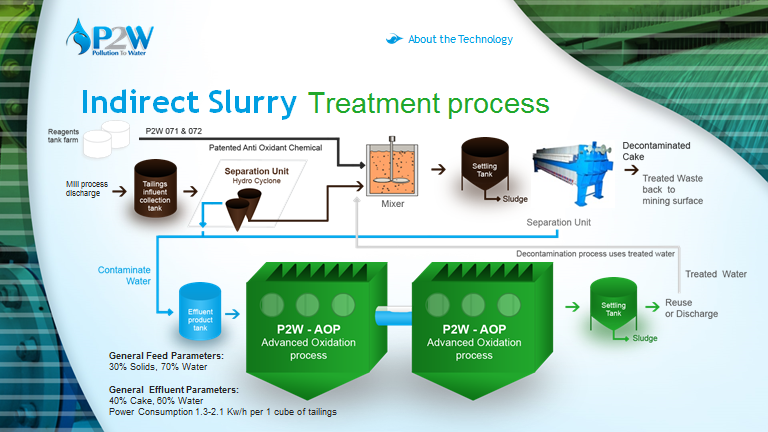 P2W’s technology for the indirect treatment of slurryis applied specifically for the purpose of removing all extractable contaminants, especially the ones that were produced by the chemical addition in the ore leach process. The first stage of the process is the extraction phase that enables us to remove all extractable contaminants from the slurry followed by, if required, a dewatering stage for achieving a higher recovery rate. The second stage of the process is to destruct all the extractable contaminants from the original slurry to levels that are below the regulation levels. 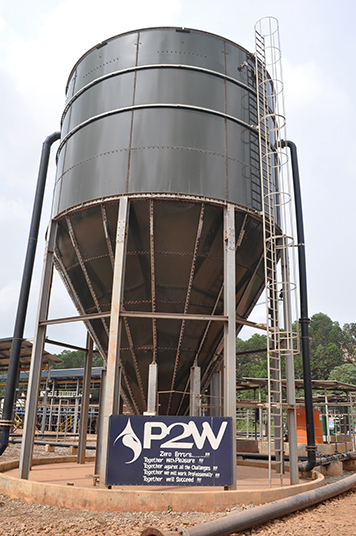 This is achieved by applying the various proven water treatment technologies of P2W. 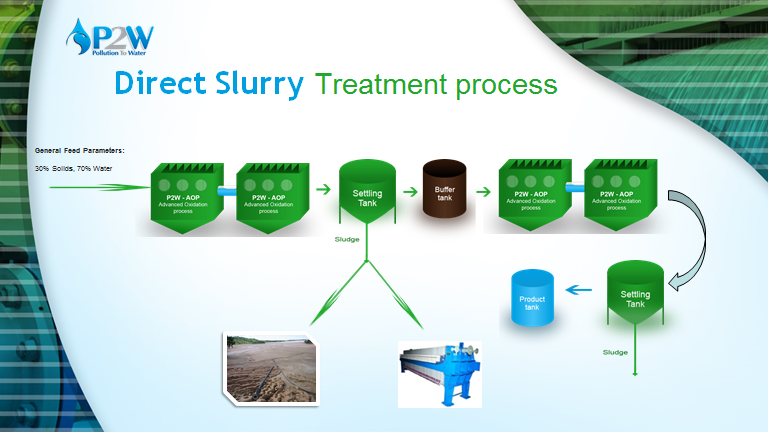 The total treatment cycle forms raw slurry into two main products: clean water and slurry. This allows the mine to save huge amounts of funds on the CAPEX and OPEX related to the construction and maintenance of the TSF and cuts future expenses for future soil rehabilitation.